Dive into a delicious deal at MLK Espresso Bar & Cafe in Broadbeach this summer during Sip & Dip Weekends. 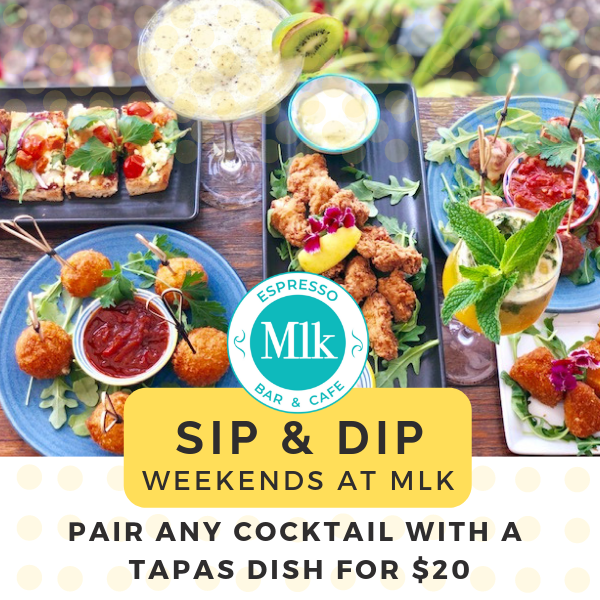 Every Friday to Sunday from 10am to 2pm, you’re invited to pair any of MLK’s refreshing cocktails with a tasty tapas dish for just $20. Sip your way into a more relaxed state of mind with a Melon Mermaid or Surfing Señorita and dig into crispy Karaage Chicken served with house-made Wasabi Mayo or bites of Crumbed Camembert topped with a tangy Tomato Relish. Our charming patio, just steps away from the ocean, is calling your name! To view the complete menu and book a table, visit MLK’s website.